There are too many high-energy positrons in the cosmic rays reaching the Earth. These positrons (particles that are antimatter equivalents of electrons) could be being produced by pulsars in our vicinity. The most recent measurements from the HAWC Observatory in Mexico have practically excluded this possibility, strengthening the competing and much more exotic hypothesis concerning the origin of the excess positrons. Our planet is immersed in cosmic rays. The particles reaching the Earth from the depths of the Universe include positrons - antimatter equivalents of electrons. Astrophysicists have long been intrigued by why there are far more high-energy positrons in the cosmic rays than could be expected by current theoretical models. 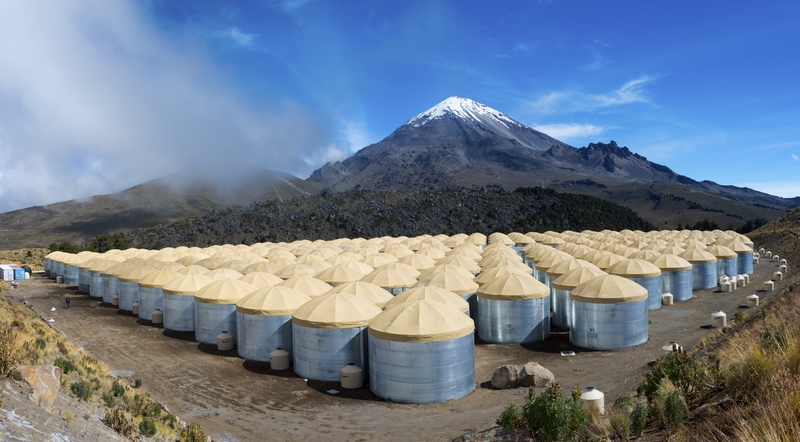 The latest attempt at an answer is the observations made by a team of several dozen researchers from the United States, Mexico, Germany and Poland, conducted using the recently activated High-Altitude Water Cherenkov Gamma-Ray Observatory (HAWC) detector. The analysis of the measurements of the cosmic ray particles, which has just been published in the prestigious scientific journal Science, included the participation of a research group from the Institute of Nuclear Physics Polish Academy of Sciences (IFJ PAN) in Cracow, financed by the Polish National Science Centre OPUS grant. "We know that high-energy particles of cosmic rays, travelling through our galaxy, quickly dissipate their energy by interacting with other radiation and magnetic fields. This is how particles of primary cosmic rays behave. Positrons are secondary, they come from interactions in which primary radiation is involved. We would therefore expect a similar dependence: a marked decrease in the number of high-energy positrons," explains Prof. Sabrina Casanova (IFJ PAN) and adds: "The reality is different. Satellite and terrestrial observatories record many more high-energy positrons than they should. Our aim was to check whether the source of the positron excess was astronomical objects in our vicinity, such as pulsars and their surrounding nebulae." "Detectors at the HAWC observatory record gamma radiation emitted, among others, by a certain population of electrons produced by pulsars and accelerated by them to huge energies. The basic question was: are there enough of these electrons for interactions with them to then produce the right number of positrons?" says Dr. Francisco Salesa Greus (IFJ PAN). 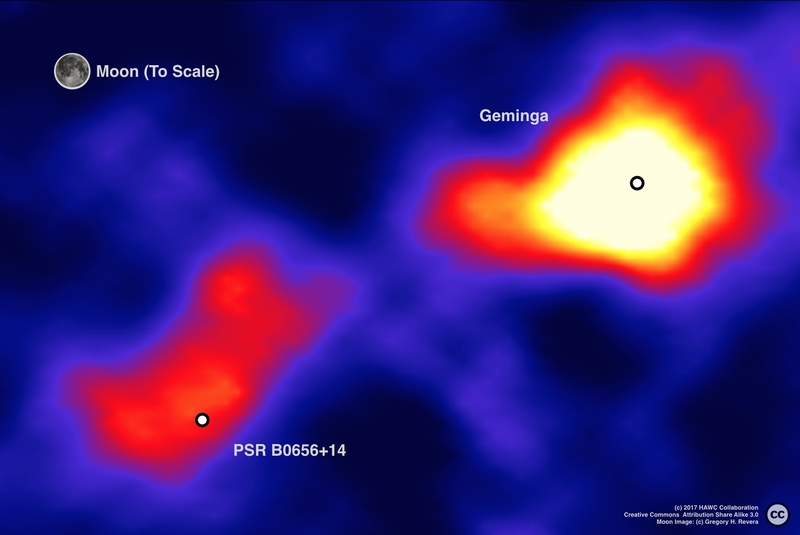 The experimental team conducted a very detailed analysis of the data collected for two relatively close pulsars known as Geminga and PSR B0656+14. The first is about 800 and the other over 900 light years distant from us. Both are among the strongest sources of cosmic rays in our region of the galaxy. The analysis, covering 17 months of observation, showed that the radiation from both pulsars and their surrounding nebulae was indeed responsible for some of the positrons in the cosmic rays. However, contrary to the expectations of a large group of researchers, this contribution turned out to be several times too small to explain the actual number of TeV positrons. "Since the involvement of close-by pulsars in the generation of high-energy positrons reaching us is so modest, other explanations become more and more likely. The most interesting is the hypothesis about the origin of excess positrons from the decay or annihilation of dark matter," comments Prof. Casanova. If the hypothesis of the origin of positrons from the annihilation or decay of dark matter turns out, over time, to be true, the excess positrons in cosmic rays would be the first particles recorded by humans to be derived from the interaction of dark matter. Whether or not they really are, will be decided by future observations. The Henryk Niewodniczanski Institute of Nuclear Physics (IFJ PAN) is currently the largest research institute of the Polish Academy of Sciences. The broad range of studies and activities of IFJ PAN includes basic and applied research, ranging from particle physics and astrophysics, through hadron physics, high-, medium-, and low-energy nuclear physics, condensed matter physics (including materials engineering), to various applications of methods of nuclear physics in interdisciplinary research, covering medical physics, dosimetry, radiation and environmental biology, environmental protection, and other related disciplines. The average yearly yield of the IFJ PAN encompasses more than 600 scientific papers in the Journal Citation Reports published by the Thomson Reuters. The part of the Institute is the Cyclotron Centre Bronowice (CCB) which is an infrastructure, unique in Central Europe, to serve as a clinical and research centre in the area of medical and nuclear physics. IFJ PAN is a member of the Marian Smoluchowski Krakow Research Consortium: "Matter-Energy-Future" which possesses the status of a Leading National Research Centre (KNOW) in physics for the years 2012-2017. The Institute is of A+ Category (leading level in Poland) in the field of sciences and engineering. "Extended gamma-ray sources around pulsars constrain the origin of the positron flux at Earth"
The astrophysics group at the IFJ PAN. The website of the Institute of Nuclear Physics Polish Academy of Sciences. Press releases of the Institute of Nuclear Physics Polish Academy of Sciences.